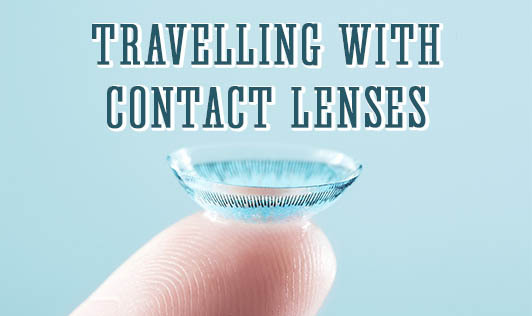 Are your contact lenses causing you trouble while traveling? Here are a few tips you can follow to make your travel comfortable when you are wearing contact lenses. Make sure you wear protective goggles to avoid dust and wind blowing directly into your face. Wind can make your contacts dry and cause itchy and watery eyes. In summer, make sure you blink often to moisten your eyes especially when the windows are open or the air conditioner is on. On long journeys, stop to relax your eyes. Consult with your doctor for lubricating drops and use them. Cleanliness and hygiene are of utmost importance. Unhygienic lenses may reduce your ability to see clearly and cause infections. Cabin air is very dry, and this may cause lens discomfort. You can wear your contacts for short flights while using lubricating drops prescribed by your doctor. The drops will help to remoisten your eyes. However, carrying a pair of spectacles would be a wise idea. Always carry your lens care kit in your hand luggage. If you plan to sleep or if you are on a long flight, wearing spectacles may be a good idea. Ask your doctor for small packs of solution which would save space. Carry enough to last for your entire holiday. Do not transfer solutions into smaller bottles yourself as you may contaminate the solution. Do not rinse your eyes with tap water. Risk of infection is high due to the presence of micro-organisms. Never swim or play water sports with your contact lenses on. Seawater or pool water may have infection-causing bacteria.